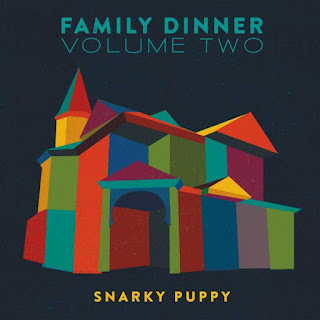 It’s taken a while to write this review, because one great strength of Snarky Puppy is, in other ways, a drawback. The band has become an unstoppable international behemoth despite making music that is unclassifiable. Their audience clearly love this about them. But the unclassifiable quality creates another issue – what do Snarky Puppy actually sound like? To put it another way, how do you know when you’re listening to them? Do they even have their own identity? They work in so many different styles, with so many different musicians and singers that, to these ears, they are more like an umbrella project than a ‘band’ in the traditional sense, and therefore you never know who they are from one minute to the next. There is no lead instrument, and most of the time there is no identifiable singer. However (and it’s a very big ‘however’), what’s the problem if you love what they do? And if that isn’t enough on its own, this release has been produced in support of the Roots of Music Foundation, which exists to educate the youth of New Orleans. The 8-track CD is accompanied by a feature-length DVD, with the now-familiar filmed Snarky performance style - drifting camerawork, blissed-out musicians surrounded by a gently nodding audience. And of course everyone wears headphones. It’s fascinating to watch, and the tunes are separated by charmingly informal behind-the-scenes interviews and bits of banter.